Customer lifetime value measures the profit your business makes from any given customer. When calculating CLV there are many nuances to consider based on the specific questions you want answered. The most straightforward way to calculate CLV is to take the revenue you earn from a customer and subtract the money spent on acquiring and serving them. Let's say that the value of an average order at your business is $50. Also, anytime someone makes an order, whether it's their first or their third, they have a 10% chance of coming back and making a repeat purchase. Finally, let's assume that it costs you $15 to acquire each new customer. The total revenue you can expect to get from each customer is your average order value divided by one minus the repeat purchase rate, or $50 / ( 1 - 0.1) = $55.56. Subtract your customer acquisition cost from that, and you get a customer lifetime value of $40.56. CLV can be calculated historically, over specific time periods, or it can be predictive. Each of these calculations serves different purposes. Predictive CLV is the most powerful way to not only understand what a customer is worth to you now, but also see how their value will change over time. Let’s look at an example for the ecommerce industry. 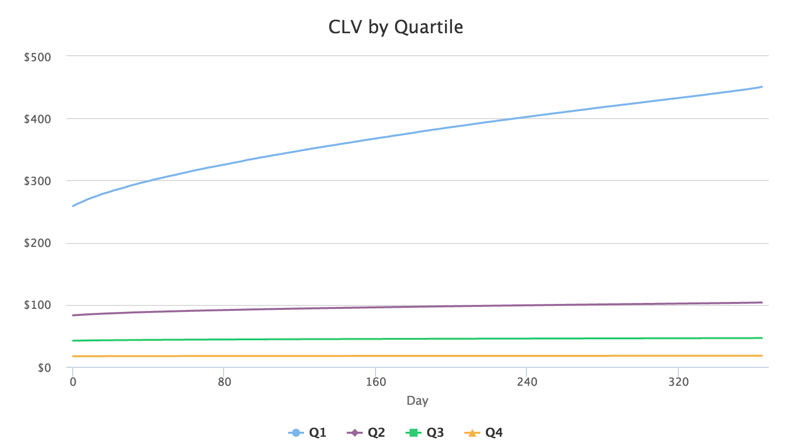 Here's a chart that shows CLV benchmark data from nearly 200 ecommerce companies. In this chart we’re looking at the most basic form of CLV. It has a single input, sum of all purchases, and closed time parameters, 365 days. On day one, customers with the highest lifetime values have already distinguished themselves. This means marketers don’t need to wait long to make important invest-or-kill decisions about their marketing campaigns. CLV is the best metric to predict future customer behaviors. Improving your Customer Lifetime Value can have a dramatic impact throughout your business. Let’s see how the estimate we calculated above would change with an improvement to the underlying assumptions. What should your Customer Lifetime Value be? Only your data can tell you what your Customer Lifetime Value should be. If you need help extracting insights on CLV from your existing data, get in touch. Stitch is a data consolidation tool that that makes it easy for online companies to build their data infrastructure, calculate CLV, and get a 360-degree view of their business. Calculate customer lifetime value across all your data sources.